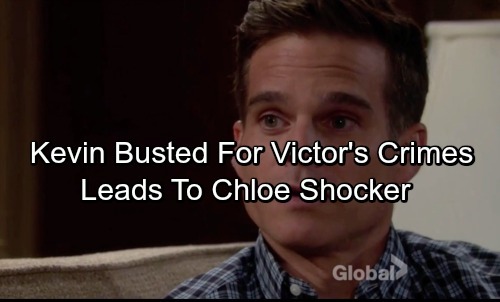 The Young and the Restless (Y&R) spoilers tease that Kevin (Greg Rikaart) will run into some major trouble on this Friday’s new Y&R episode, September 29. He’s in town to carry out a couple missions for Victor (Eric Braeden), but both of them come with huge risks. For starters, Kevin is supposed to make sure Nick (Joshua Morrow) takes a $500 million hit. Victor is hoping to show his son what it really means to be on his own. Now Victor is adding another assignment, which involves accessing Nikki’s (Melody Thomas Scott) cell phone info as well as her email account. Kevin is committing crimes that could lead to serious consequences. He’s usually great at pulling off sneaky plans, but he’ll inevitably face some setbacks here. Y&R must want Kevin to take a little heat before he heads home to Chloe (Elizabeth Hendrickson). The Young and the Restless spoilers indicate that Kevin will indeed end up on the hot seat. Someone will get a clue and grill Kevin about whatever he’s up to. Who will grow suspicious of Kevin and why? Perhaps a concerned Genoa City resident will spy Kevin wrapping up a meeting with The Moustache himself. Nick, Chelsea (Melissa Claire Egan), Jack (Peter Bergman) and Nikki all seem like good options. If one of them realizes Victor and Kevin have teamed up, it’ll make sense when disaster strikes later. For now, Kevin will have to dodge some tricky questions. He’s obviously in a tight spot, but he’ll try to keep the truth under wraps. The phone and email hacking is nothing compared to the money swiping. Plus, it’ll be much harder for Nikki to guess that anything’s wrong. Nick, on the other hand, it going to notice when his bank account is drained. If he had any inkling of Victor and Kevin’s scheme before, the missing money will confirm it. Once all of this gets stirred up, The Young and the Restless spoilers say Chelsea will be particularly curious. She’ll undoubtedly wonder why Kevin was so willing to help Victor. Could this lead to a confession about Victor helping Chloe escape and Nick’s knowledge of it? That would certainly cause chaos for Chelsea and her relationship. Will Kevin regret moving forward with Victor’s plots? Could he be forced to double-cross Victor at some point? We’ll give you updates as other Y&R news comes in. Stay tuned to the CBS soap and don’t forget to check CDL often for the latest Young and the Restless spoilers, updates and news.